The eBook sales appointment course in this week’s Sales Buzz shows you how to use the 3 steps to make cold calls to new prospects. This is a quick and easy sales training technique for cold calling for appointments that you can use for yourself or present to your team. This 8 page course gives you a quick to learn 3 step process to make great calls that will get you in front of potential customers. Follow the 3 steps and complete the exercises and you will have your own script ready to use in just a few minutes. This basic sales training works because it gets down to the essential elements that must be included in an effective call. I manage working sales teams and sometimes I need to train people to make appointments calls in the shortest possible time, click the image above and see just how fast it works. A way to get non sales people making appointments for my sellers. A starting point and then added more training and ideas to make it more effective and profitable. Or, as a quick refresher course to sales people to give their appointment calls more buzz and motivation. To open your free course just click the image or open Free Sales Appointments Training. Some time ago I was asked to do a project with a field sales team in a service industry to try and increase the number of prospects they met with each month. Some of these guys had been in the business a long time and their sales activity followed a set pattern created over a number of years. The majority of the team were great at selling face to face with a prospect. They were confident because of their good product knowledge, and they were successful at closing sales. When it came to making sales appointment calls to arrange meetings with prospects all that confidence drained away. Some didn’t like it, some hated it, and others did their best to avoid it. Cold calling prospects requires a different set of sales skills and if the project was going to be successful I needed a quick and easy way for the team to learn the basics of appointment calling. I also needed a way of instilling confidence while they were making the calls. 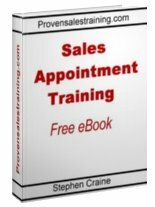 That’s when I developed the Free Sales Appointments Training. To help the field sales team become effective and confident on the phone I developed the sales appointment course with a focus on 3 essential elements. Using the exercises that you will see when you open the free training course, the field sales team quickly built an appointment call script for both cold calls and follow ups for warm leads. They created an introduction that they could use with confidence because they saw how it included potential benefits and really good reasons why they were calling. When they thought about why they needed to ask qualifying questions it soon became apparent that this was something they had not understood before. They used them face to face when selling, but the questioning stage is different on the phone. As field sales professionals they saw gaining agreement to an appointment as the equivalent of closing a sale. It isn’t, and there are sales techniques that work much better than traditional sales closes to get the prospect to agree to meet with you. You can see these appointment agreement techniques, and how to use the other stages of a call, by opening the Free Sales Appointments Training.